In his State of the Union address on Tuesday night, President Trump called for bipartisan unity while he attacked Democrats and the Robert Mueller investigation, denounced efforts to expand abortion rights in Virginia and New York, attacked immigrants and reiterated his demand for a border wall—with no mention of the longest government shutdown in U.S. history, which delayed his address by a week. In his State of the Union address on Tuesday night, President Trump called for bipartisan unity while he attacked Democrats and the Robert Mueller investigation, denounced efforts to expand abortion rights in Virginia and New York, attacked immigrants and reiterated his demand for a border wall—with no mention of the longest government shutdown in U.S. history, which delayed his address by a week. Women in Congress wore all white to the speech in a nod to the movement for women’s suffrage. After the address, former Georgia gubernatorial candidate Stacey Abrams made history, becoming the first African-American woman to give the Democratic response. 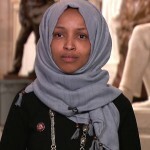 Rep. Ilhan Omar of Minnesota is the first Somali American elected to the House of Representatives and one of the first Muslim women in Congress. Her guest at last night’s presidential address was a Liberian woman who fled to Minnesota in 2000 due to civil war and is now facing the threat of deportation from the United States. As Democracy Now! continues to discuss President Trump’s State of the Union, they are joined by Ana María Archila, co-executive director of the Center for Popular Democracy. She attended the address as a guest of New York Congressmember Alexandria Ocasio-Cortez. In September, Archila made headlines when she, along with another woman, Maria Gallagher, confronted Republican Sen. Jeff Flake of Arizona in an elevator after he announced his support for Judge Brett Kavanaugh’s nomination to the Supreme Court. Shortly after the confrontation, Sen. Flake called for a delay of the Senate vote pending a limited FBI investigation.